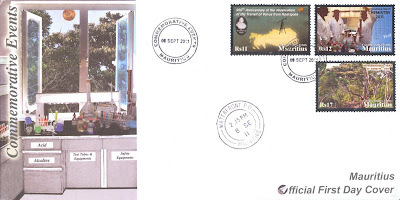 The Mauritius Post released on September 8, 2011 a set of 3 stamps to celebrate international (scientific) events. It was the first time ever that stamps of denominations Rs11 & Rs17 were issued. Mauritius takes pride in having been associated (concurrently with 61 other sites of observation around the world) with the astronomical study of the Transit of Venus on June 2, 1761. The 'Académie des Sciences' sent a team headed by French scientist and Clergyman Cannon Alexandre-Gui Pingré for this observation in the island of Rodrigues. In spite of the unpredictable climatic conditions, the mission was successful. Pingré observed the track of Venus over the disk of the Sun and the distance of Venus to the border edge of the sun, with a micrometer applied to the bezel of 18 foot. At the same time, a member of his team observed the passages from the edges of the Sun and Venus by a wire horizontal and vertical of a quarter-circle. In his report submitted to the 'Académie des Sciences', Clergyman cannon Pingré described the methodology used to define the observations of the parallax of the Sun. From the observations made in Rodrigues in 1761 and those of 1769 in Saint Domingue (Caribbean region), he calculated the distance of the Sun to be of 92,796,950 miles which is only at 0,17% of the estimated distance of 92,956,038 miles. The ecliptic conjunction of the Venus and the Sun lasted for 6 hours. The International Union of Pure and Applied Chemistry in conjunction with the UN and UNESCO have proclaimed the year 2011 to be the International Year of Chemistry (IYC 2011). The goals of IYC 2011 are to increase public appreciation of chemistry, to encourage interest in chemistry among young people and to generate enthusiasm for the creative future of chemistry. 2011 coincides with the centenary of the Nobel Prize awarded to Marie Curie and this is an opportunity to celebrate the contributions of women to Science. This year also marks the centenary of the founding of the International Association of Chemical Societies, providing a chance to highlight the benefits of international scientific collaboration. The stamp illustrates chemists at work and on the right Mendeleev's Periodic Table and the chemical formula for water, H2O. The UN General Assembly has proclaimed 2011 as the International Year of Forests which conveys the theme of "Forests for People". It celebrates the central role of people in the sustainable development of our world's forests. The Forests and Reserves Act No.41 of 1983 caters for the protection and management of state forests and reserves. The forests of Mauritius were once abundant sources of valuable timber and this situation led to the decimation of most of our indigenous forest during early colonisation. Today, less than 2% of the total surface area of Mauritius is still occupied by native forest. However, in an attempt to conserve and reforest degraded land, the Forestry Service, in collaboration with other institutions are actively involved in the conservation and restoration programs to recreate the pristine ecosystems. The stamp shows a native forest in Mauritius. Printer - BDT International Security Printing Ltd.